In our opinion: To prevent Parliament becoming the preserve of the wealthy, something needs to be done about pay and MPs. But not what IPSA is suggesting. 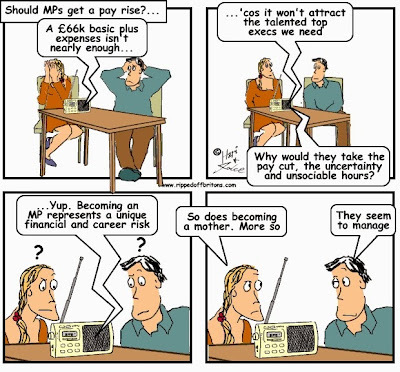 2) Fair: to be fair to MPs, allowing them to earn what other professionals in equivalent jobs earn. Both are nonsense. We look at the "equivalent jobs" ruse in a seperate post - >>CLICK HERE<<. In this post we consider helping poorer people into Parliament. The time to help poorer people become MPs is not when they are MPs with all an MP's generous earning opportunities (see below). The time to help the poorer is before they are MPs when they are still 'poorer'. The time to help is when they are still in the scrum trying to get an MP’s job: first to get selected as a candidate, then to get elected as an MP. Once in Parliament an MP’s basic pay, even without the 2015 10% payrise, puts them in the top 6% of wage earners in the UK. Squirm into a minister’s salary, and they are in the top 3%. Scrabble into the Cabinet, and they are in the top 2%. Even an ordinary backbencher, by employing their spouse as helper, can get more than 98% of UK wage earners. Apart from money paid to them by Parliament, MPs are in addition allowed to hold as many other paid jobs as they like. 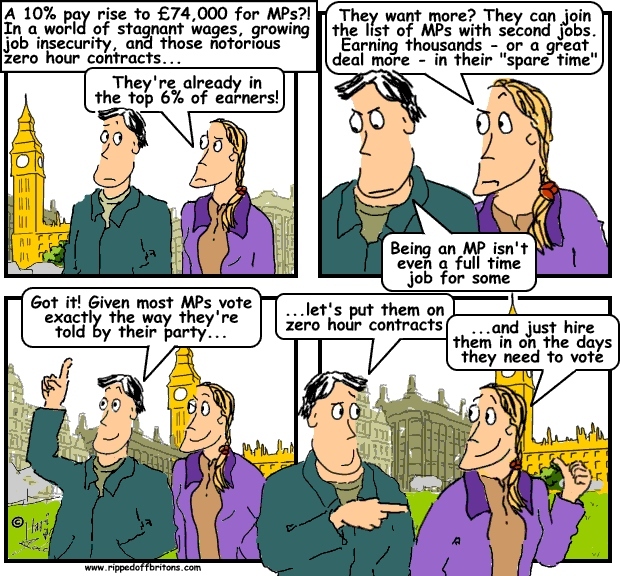 Some earn far more in the spare time being an MP gives them than their basic MP's salaries. The reality is MPs are already very well paid for what they do, both as an MP and all the other stuff. Those who worry about helping the poorer into Parliament need to adjust the aim of their generousity. Once they are MPs, the poor are no longer poor enjoying as they would be an MPs various remunerative opportunities. Those who worry about the poor need to help them BEFORE they become MPs. The wealthy can afford to play at getting into elected politics without having to earn a salary. The not-wealthy have a greater need to focus on their day-jobs to pay their bills. 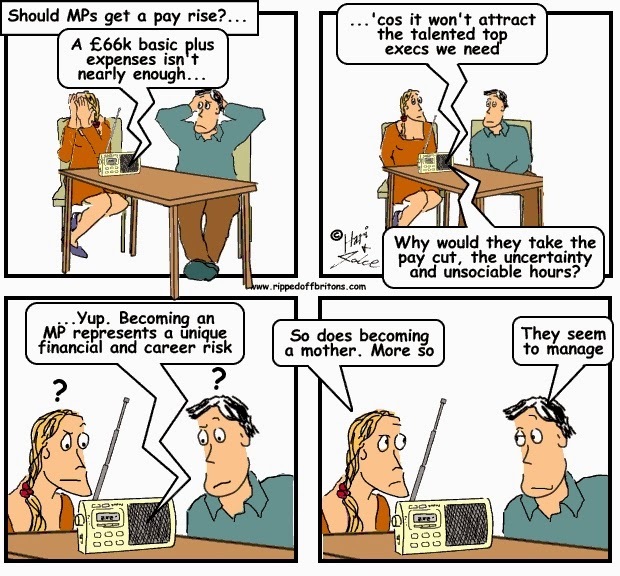 Therefore the pay rise should not go to MPs, but to anyone who is not an MP. Raise the minimum wage so even the meanest of us can afford to take time off to get into politics. Or, in a time of austerity when we can't afford to give all non-MPs a payrise, limit it to those who are not an MP but want to be an MP. An “MP’s Job Seeker’s Allowance” (MP-JSA). Would that get public support? Probably Not. Basic Income is a good way to increase and broaden participation in politics by solving this problem.